I believe that model is likely to unravel soon. At the core of the argument for the business model is that cable is somehow not susceptible to the same disruptive technology that in caused the music business to collapse. That belief is flawed for many reasons. We've seen signs that glass house is indeed cracking. Aside from the growth of online services like YouTube (which is free), Netflix (which is subscription), Hulu (there's a free version and a subscription version) and others, big cable companies that have the most to gain from fighting that model are now starting to fight back. In the one entitled "Is the Future Pay TV Model As Safe as The Atlantic Believes It Is? ", I noted that during the first six and a half months of 2012, there were 22 fee disputes involving the price of broadcast TV signals have caused channel blackouts, according to the American TV Alliance. That was up from 15 blackouts in all of 2011, and just four in 2010. Then, there are business initiatives such as the Barry Diller-funded effort called Aereo.com which began in the town I live in (New York City) but is expanding to other cities in 2013. In spite of dozens of legal copyright-infringement lawsuits filed by the major media conglomerates which accuse Aereo of unlawfully copying their content, Mr. Diller argues what he's doing is entirely legal because customers are assigned individual antennas at its data centers, so they're basically just renting the use of their own antennas and have that delivered via the internet. Aereo uses a dime-sized TV antenna and crams hundreds (or perhaps thousands of them) into boxes located at the company's data centers. AP claims each box is the size of a dishwasher. As a result, the company says it's similar to what viewers would get for free by installing the same equipment at home. By contrast, cable companies use a single antenna or direct feed from a broadcaster to pick up a station for thousands of subscribers. Ultimately, the courts will decide. But last July, a federal judge in New York refused to give the broadcaster conglomerates (Newscorp's Fox, Disney/ABC, CBS/Viacom which Mr. Diller himself used to run, and NBC Universal/Comcast) who were suing Aereo a preliminary injunction to stop the service, although the case remains pending. More recent moves have bypassed broadcast networks altogether, in effect, cutting the media conglomerates out of the equation. Netflix, for example, signed a deal with Disney. As the cost of production has declined, some producers can make high-quality content at a low cost and do the same thing. Beyond that, online content is finding its own audience without the help of big broadcasters to distribute it. Indeed, YouTube is living up to its name. Anyway, we saw one major cable company finally push back. Last month, Cablevision sued Viacom over alleged antitrust violations, another challenge to the business model of consumers being forced to pay for channels they don't want to get the few they do want. Personally, I couldn't have imagined this would happen quite as fast as it is happening. Cracks are forming in the pay-TV fortress. And Cablevision is the latest to deliver a blow. The cable provider's announcement Tuesday that it has sued Viacom over alleged antitrust violations ups the ante in the continuing battle over the rising cost of TV content. Pay-TV providers say they can't pass along the escalating prices being charged by media networks to customers already paying more than $70 a month for video alone. At the same time, they are facing increasing pressure from a rapidly changing media-technology environment in which some viewers are getting video from other sources such as Netflix. n its suit, Cablevision alleges Viacom forced it to carry and pay for 14 "lesser-watched" channels for the right to carry its more popular "must-have" networks, including Nickelodeon, MTV and Comedy Central. The practice of packaging channels together, known as bundling, is standard for network agreements with distributors. To show Viacom did anything illegal, Cablevision must demonstrate the terms are so onerous it was essentially forced to take all the channels, a practice known as tying. Viacom has said it will defend itself vigorously against the claims. If the case undermines typical channel-bundling contracts, it could have far-reaching implications. Media companies may have to allow pay-TV operators to sell channels separately or in different groupings, possibly forcing less popular channels—which generate advertising revenue for networks—to shut down. But the lawsuit is unlikely to get that far or produce such an extreme outcome. More likely, Cablevision hopes to push Viacom to the settlement table to work out more-favorable terms. The following graphic from AP shows how the frequency of such disputes have increased in recent years. Indeed, Cablevision may be targeting Viacom rather than other content providers because of its apparent vulnerability. Viacom has no sports programming, among the most popular and lucrative content. 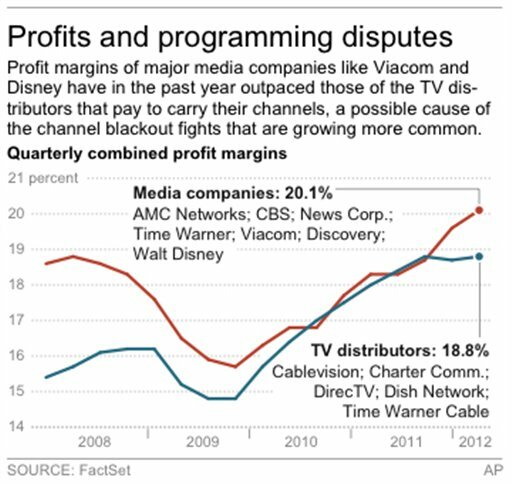 And ratings at Viacom's top networks have been suffering. Beyond the specific players involved, the dispute reflects widespread industry pressure. Time Warner Cable Chief Executive Glenn Britt said last month that his company's content costs have risen 32% in the past four years, while average revenue per residential user has risen only 16%. Time Warner Cable has openly threatened to cut less-popular channels, dropping arts channel Ovation at the beginning of the year. 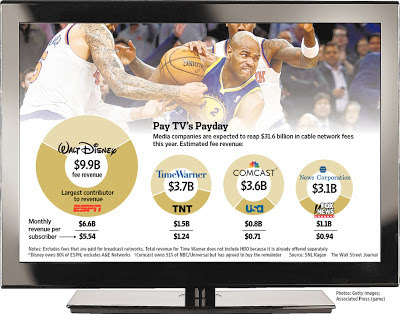 And other pay-TV providers have lashed out. Last summer, Viacom's channels went dark on DirecTV for nine days before an agreement could be hammered out. While Cablevision's suit isn't likely to set a legal precedent, it may succeed in driving home the point to consumers that the bundling of channels and rising costs to carry them are what is pushing up their monthly bills. This wasn't lost on a number of Cablevision's peers, including Time Warner Cable, Charter Communications and DirecTV, which issued statements in support of the lawsuit. If it keeps up the vocal push for à la carte channel offerings, pay TV may find itself with a rare ally: its own subscribers. A version of this article appeared February 28, 2013, on page C8 in the U.S. edition of The Wall Street Journal, with the headline: Cablevision Picks at Ties That Bind. Disney earns more than $10 billion in such bundled fee revenue, mostly from its majority-owned ESPN group of channels, according to estimates from market researcher SNL Kagan. That's about a third of the $31.6 billion expected to be generated industrywide by such fees this year, excluding premium services like HBO and broadcast outlets, Mr. Kagan told the Journal. It added that the size of these fees varies widely, noting that while ESPN gets $5.54 per subscriber a month, Viacom's MTV gets just 41 cents per subscriber. Niche channels get much less. MTV Hits, for instance, gets two cents, according to Kagan. The following graphic shows just how much these fees contribute towards the bottom lines of companies like Disney, Time-Warmer, Comcast's NBC Universal unit and News Corp.
"Now pay-TV executives—as well as its customers—are openly pondering a world where the bundle no longer reigns, even though such a scenario could be years away." "There has long been intense debate about whether unbundling would save consumers money. Two studies by the Federal Communications Commission in the past decade came to opposite conclusions. A Temple University study, meanwhile, concluded only incremental savings for consumers, and that was before accounting for the higher costs for customer service and programming that distributors would likely pass along." "Mike Fricklas, general counsel at Viacom says the conversation will change only if 'cutting the cord' becomes a widespread reality. 'As of right now,' Mr. Fricklas said, 'the cable packages are expensive to some people but not so expensive that people aren't choosing to subscribe. But another pay-TV executive said improved Internet distribution of video will 'force the change.'"